William Westmoreland escapes his unfulfilling Rhode Island existence by traveling to Florida twice a year and chartering Mike Jansen's fishing boat to take him out on the Gulf. The crystal-blue water and tropical scenery isn't the only view William enjoys, but he's never made his move. A vacation romance just isn't on his horizon. Mike started his Apalachicola charter fishing service as a way to care for his daughter and mother, putting their safety and security ahead of the needs of his own heart. Denying his attraction becomes harder with each of William's visits. William and Mike's latest fishing excursion starts with a beautiful day, but a hurricane's erratic course changes everything, stranding William. As the wind and rain rage outside, the passion the two men have been trying to resist for years crashes over them. In the storm's wake, it leaves both men yearning to prolong what they have found. But real life pulls William back to his obligations. Can they find a way to reduce the distance between them and discover a place where their souls can meet? The journey will require rough sailing, but the bright future at the end might be worth the choppy seas. I absolutely loved Setting the Hook and I am so very glad that Greg Tremblay was the narrator for this story because I would have never read the book, and that would have been a shame. You may be wondering why I got an audiobook for a book I wouldn’t have read. Honestly? I’m in love with Greg Tremblay’s vocal performances. Even with my love of the narrator, I hesitated to listen to Setting the Hook. Are you still wondering why I wouldn’t read the book? It comes down to the simple fact that the story takes place in an area of the Florida Panhandle where I grew up AND a hurricane plays a big part in bringing William and Mike together. I have had a horrid experience with books that feature hurricanes as a major plot point, and by that, I mean, the authors have royally effed it up – including an author whose bio claimed they lived in Florida. So when an author puts said hurricane in my neck of the woods, I’m beyond hesitant to pick up that book. While Grey’s bio does not lay claim to living in Florida, the scenes in the book that deal with the hurricane made it clear to me that he has either experienced them firsthand or researched the heck out of them, including talking to people who have weathered hurricanes – both storm veterans and newbies. And nothing made this more obvious than the scene at Mike’s house when William asks Mike how he can be so calm, all while thinking that there’s absolutely no way he (William) can hope to get any sleep while the storm rages on. As someone who has weathered over forty hurricane seasons, a little over half of those within an hour of where Setting the Hook takes place, I found it easy to relate to Mike’s calm during the storm (and yes, I’ve gone to bed in the middle of more than one hurricane), recognized William’s fear as I’ve had to reassure more than one person as they experienced their first major hurricane, and appreciated the details that Grey added to the story that made it so easy to do both, as well as Tremblay’s ability to convey both men’s conflicting emotional states before, during, and after the storm. As for the romance between Mike and William, I thoroughly enjoyed getting to know these two men who came from completely different worlds, watching the sparks ignite, and seeing them fall for each other even as they told themselves that nothing could come of it being as they didn’t live in the same state, let alone live compatible lives. I appreciated how Grey didn’t pen a quick and easy solution for their situation, even though William comes from money and could have made the move to Apalachicola with little effort. Both men had others who depended upon them and things that they had to take into consideration before diving into a relationship. Too often, authors ignore the maturity their characters should display in matters of the heart in what seems to be an exchange for manufactured angst; but that did not happen here and I’m thankful to Grey for it because there were enough “naturally occurring” issues for them to deal with. And yes, I am trying very hard to keep this vague because their issues are what makes for good reading/listening – as well as the smoking hot chemistry between Mike and William. While I had to agree with William’s assessment of his mother, I was glad to see that his parents were supportive of his relationship with Mike – once they got over the initial shock of the situation. I particularly enjoyed seeing William’s mother get pulled in by Carrie’s charms. But even more notable was seeing the change in the relationship between William and his father. I loved how William learned more about his parents’ history and how his father was able to use their experience to guide William in his relationship with Mike. The parallels between the two relationships were beautiful to see and made the story that much richer. Of course, Tremblay’s vocal talents and his ability to convey just the right emotion for the characters and the scenes just made Setting the Hook that much more entertaining. I thoroughly enjoyed the audiobook edition of Setting the Hook and I look forward to the next installment in the Love’s Charter series because I cannot wait to see what happens between Billy Ray and Skippy! 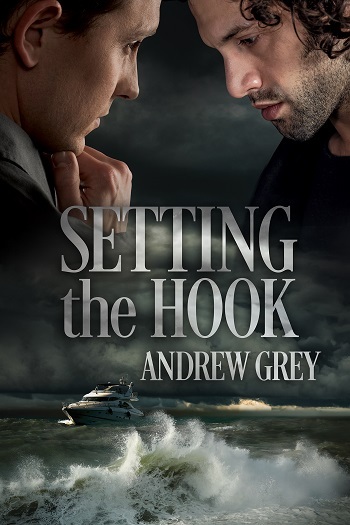 Reviewers on the Wicked Reads Review Team were provided a free copy of Setting the Hook (Love's Charter #1) by Andrew Grey, narrated by Greg Tremblay to read or listen to and review.